Technology is evolving at a rapid rate. From desktop computers, to smart phones, to touch screen tablets, today’s market is filled with an astounding array of gadgets that help put information at our fingertips. While technological advances are exciting, they also can create challenges for brands and businesses. For instance, how does a brand create a positive user experience on their website when users are accessing it through what seems like a limitless number of devices? The answer: responsive design. When updating your B2B web design, one of the best things you can do is incorporate a responsive design. A responsive website allows you to have one website with one URL that will display properly on any device a website visitor is using. Whether your prospective client is searching for your business on a smartphone, tablet, laptop, or computer, a responsive B2B website design will provide them with a terrific user experience. When it comes to a website redesign or a new website launch, budget is always a consideration. That’s why we have compiled all the responsive web design statistics you need to make a case for a new B2B website that is responsive. Smartphone users check their devices 150 times a day. 67% of cell phone owners check their phone for messages, alerts, or calls — even when their phone is not sending an alert. 44% of cell phone owners admitted to sleeping with their phone by their bed because they did not want to miss any calls, text messages, or social media updates while they were sleeping. 34% of smartphone users go online mostly using their phones, and not on a desktop, laptop, or other device. People using a desktop computer to search online will increase from 1.4 billion to 1.6 billion users in 2015. People searching online using a smartphone will increase from 800 million to 1.9 billion users in 2015. 46% of people using mobile devices report having problems viewing a static site. A static site is a traditional, non-responsive website. 44% of people surveyed claim that navigation was difficult on smaller devices. Mobile online search has increased in leaps and bounds over the past few years as mobile technology has vastly improved. When choosing whether your B2B website redesign is going to include responsive technology, it’s best to know all the facts and statistics. Not only are people changing how they think about their mobile technology, but mobile technology is changing how they think about websites. A responsive website, or even a mobile optimized website, addresses the common complaint of not being able to view a static website or having issues with navigation on smaller devices. When your ideal prospective client finds your website, you want to ensure they have a great experience and are able to view, locate, and engage with all the information they need. A responsive B2B web design sets the stage for a fantastic user experience and contributes to better website conversions. If statistics do not convince you that getting mobile-friendly with responsive design is important, then hop into your Google Analytics and go to the Mobile Overview in the Audience portion. Chances are, if you do a traffic comparison between this year and last, you’ll notice that your mobile users have grown, potentially significantly. 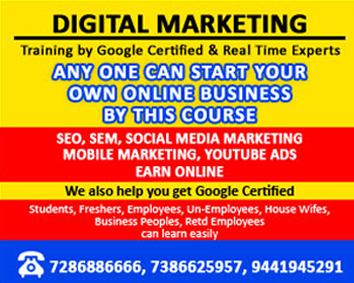 S.R.J Infoways (Vizag of school of Digital Marketing) is the First Internet Marketing Training Institute in Vizag, trained more than 100+ Students during the past two years and got Adword certified.